A $1.00 cable definitely didn’t do the trick. A 12-year-old cable was surprisingly good. How about a cable from a home improvement store? 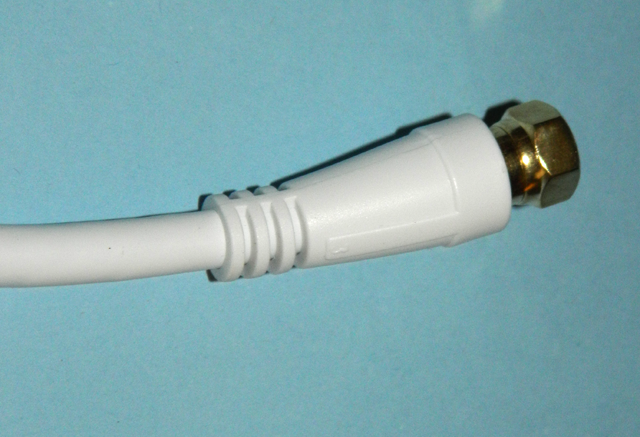 The cable in question was the Philips SWV2172H/17, commonly found at home improvement stores. It’s an inexpensive cable, about $4.00 but according to Philips web site, it’s designed to provide you a “reliable audio/video connection between components.” I bought this one several years ago and Philips still has the same one on their web site, except now it has nickel plated connectors. It’s a nice thick cable with a sturdy molded plastic shroud and yellow connectors. I bought this cable because I needed something in a pinch. It worked for a couple of days until the cables I ordered came in the mail. I put it in a box after that and haven’t touched it since. Let’s see what it looks like on the inside. Molded plastic is no match for a rotary tool. This bit of destruction took about 15 seconds. After making a quick cut through the center of the connector, I carefully sliced it away from the jacket. It was either glued or molded right onto the cable. That inspired confidence. So far this was starting out very well. The connector laid out for all to see. 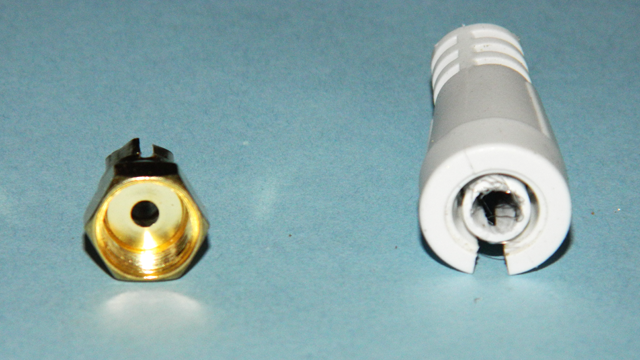 The connector itself looked a little like the Uninex one, with two parts. 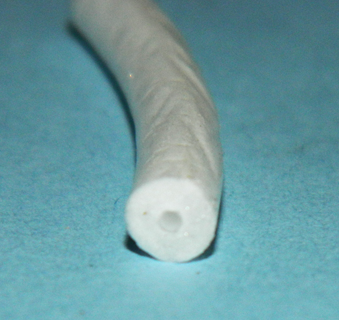 The outer shroud had an inner lip and the metal connection point fit between outer and innter. The plastic looked nice and thick and the metal part didn’t fall apart when I disconnected it. 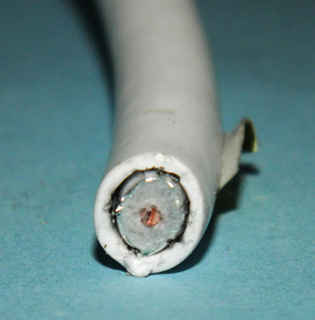 A cross section of this cable didn’t look as promising as my 12-year-old cable but it did look “ok.” The dielectric looks nice and thick and like my 12-year-old cable it’s a little bit oval-shaped, possibly from storage. I was feeling pretty good so far. Real brass? Well shucks. Imagine that. I don’t trust gold-colored connectors. 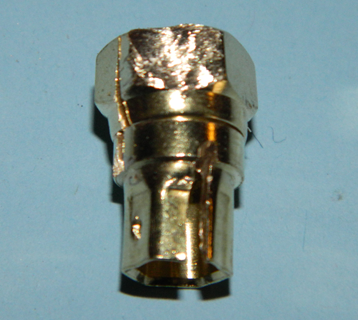 Back in the 80s there was a push to make gold-plated connectors. Supposedly they had less loss and therefore gave a better connection. Maybe that was true but the industry jumped on this and pretty much every cheap connector you found for the next 10 years had a gold paint job. Usually it wasn’t real gold but just lacquer, which probably made the connection worse. So I held a grudge against this connector from day one. I took a grinding wheel determined to watch the gold color flake off quickly. Imagine my surprise when it didn’t. It looks like this connector is solid brass. Without nickel plating it’s not great against corrosion but for indoor use it should be fine. Surprisingly well done. And then… things took a turn for the worse. There were a total of 8 strands of wire in the shield and under that a layer of foil that wasn’t even sealed. I cut a large part of the sheath away carefully and I was able to see that the foil was wrapped loosely around the dielectric, so loosely that it pretty much fell off. This was probably ok for most indoor use but I was beginning to feel like I shouldn’t trust this cable very much. The dielectric was in good shape though, and because there was no actual attachment between the shield and the dielectric it actually looked clean too. Looked at from this view, it’s easy to see that the dielectric was nice and thick and while that didn’t excuse the pathetic amount of metal in the jacket, it certainly helped compensate by shielding the core. The core itself was nice and thick, similar to my old cable company cable and like that 12-year-old cable it wasn’t solid copper but it did have a nice amount of plating on it. Just as fate would have it my daily backup started. The TV is about two feet from the external hard drive. All of a sudden I started seeing pixelation and freezes. Not really heavy problems, just small ones. About five minutes later I got a very brief 771 error. I changed channels, not thinking anything was really wrong, and I got another 771 about five minutes later. By now I was suspecting the RF interference from the hard drive might be the issue and so I stopped the backup. I watched for about another 30 minutes without any evidence of problems. There’s your “aha” moment. Because of this experience, I have to actually rate the Philips cable the worst of the three I’ve tested. The $1.00 cable fell apart almost immediately so I knew it was bad. The 12-year-old cable never failed. This cable looked good most of the time. It was only because I was paying attention that I saw the problem. This is just the sort of cable you don’t want in your entertainment system. It will give you intermittent problems for years and you’ll never know why. 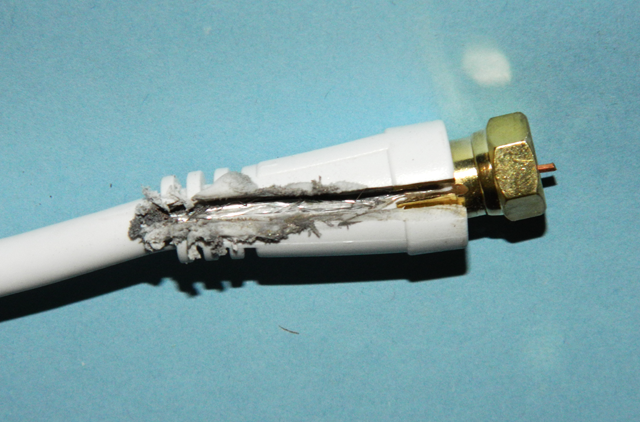 This is the sort of cable that will make you tear down your entire system to find the problem. It comes down to the cheap shielding that Philips used here, and any sort of RF interference will cause this cable to give you trouble. In our next and final article, we’ll look at the King Kong of cables. I’m sure it will perform but I’m anxious to see how it’s built. Get live TV on your AppleTV with HDHomeRun!